Although they are not famous for their knowledge of constitutional law or history, John Lennon and Paul McCartney got it right when they linked the idea of constitutional change to the processes of revolution and evolution. Inevitably, the content and character of a nation’s constitution is largely determined by the circumstances in which that nation is created. A constitution drafted along with a country’s gradual evolution toward independence will have a very different emphasis than a constitution drafted on the heels of a political revolution. The point of this article is to briefly explain how Canada’s constitution, and especially the Constitution Act, 18671, reflect the fact that our country became an independent nation through a process of evolution rather than revolution. What Does a Constitution Do? In order to understand how Canada’s constitution reflects our development as a nation, it is first necessary to understand the role that a constitution plays in modern society. Over the course of world history, many societies have been ruled by people who took power by force or by birthright. In these societies, laws governing the conduct of the general population were created more or less at the whim of the ruler.2 With the rise of democracy, however, came the idea that laws should reflect the public interest rather than the particular interests or idiosyncrasies of the lawmakers. In other words, in order to be legitimate in a democracy, laws must be: (1) predictable; (2) enforceable against everyone (including the people making the laws); and (3) created in accordance with defined systems which appropriately limit the power of law-makers. The notion that laws should fulfill these requirements is known as the rule of law or constitutionalism. In its earliest days, Canada did not have a written constitution. The territory now considered Canada was populated by colonists from France and the United Kingdom and the colonists were governed by the laws of their home countries. As the territory of Canada became more populated and the United Kingdom assumed authority over both French and English colonists, however, it became apparent that some system of local law-making was required to take account of the unique, regional needs of the colonies. From the mid-1700s to the mid-1800s several laws were passed by the United Kingdom in order to establish mechanisms for governance in the colonies. These documents were steps along the way to the United Kingdom’s enactment of the British North America Act, 1867, known today as the Constitution Act, 1867. This statute united the colonies into a single Dominion of Canada and set up a system of local law-making. The decision to unite the colonies was not done with the intention or purpose of having Canada break away from the United Kingdom. Unlike the United States, Canada was not born of revolution. Instead, the union of colonies was formed for primarily pragmatic reasons, such as fostering economic and trade relations between the colonies and strengthening military defences against a possible invasion from the United States. Whereas the constitution of the United States was drafted by ‘the people’ following a successful war against the United Kingdom, Canada’s initial constitution was drafted by statesmen loyal to the British Empire. So, while the Constitution Act, 1867 created mechanisms for local governance within the territory of Canada, it was drafted with the intention and understanding that Canada would continue to be subject to the authority of the United Kingdom. Several features of the Constitution Act, 1867 reflect the colonies’ intentions to remain subject to British rule. Most obviously, the Constitution Act, 1867 did not include any mechanism for amendment. This means that the constitution of Canada could only be changed by the United Kingdom – a clear indication of the intention that the United Kingdom would hold ultimate legal power over Canada. Further, laws of the United Kingdom continued to apply in Canada despite the fact that the Constitution Act, 1867 created law-making bodies within Canada. It was also an unwritten assumption of the Constitution Act, 1867 that many of the principles of government employed in the United Kingdom would be applied in Canada even if they were not specifically mentioned in the constitution. (For example, it was assumed that Canada would apply the British Parliamentary tradition of having the monarch or his/her representative ask the leader of the political party winning the most seats in a general election to form a government. Likewise, as in the United Kingdom, it was understood that the leader of the governing party [at the federal level] would be called the Prime Minister. Even today, such traditions form part of Canada’s ‘unwritten’ constitution). In addition, while the Constitution Act, 1867 provided for the creation of a Canadian court system, court cases from Canada could be appealed to the United Kingdom. In short, the Dominion of Canada, as created by the Constitution Act, 1867, was not an independent nation. Instead, the Constitution Act, 1867 represents only a step (although admittedly a significant one) in Canada’s evolution towards independence. It was not until much later that laws were passed in the United Kingdom to provide more autonomy for Canada. For example, it was not until 1931 that United Kingdom laws ceased to automatically apply in Canada5 and not until 1949 that the Supreme Court of Canada became the highest appeal court for Canadian court cases.6 Ultimately, from a constitutional point of view, Canada did not become a fully independent nation until the passage of the Constitution Act, 1982,7 which includes a constitutional amending formula empowering Canadian law-makers to change the written constitution without the approval of the United Kingdom. The system of local law-making established by the Constitution Act, 1867 is a federal system. This means that law-making power is divided between a central or federal parliament and regional or provincial legislatures. Once again, the decision to adopt a federal law-making system in Canada is a result of Canada’s historical evolution. In large part, the decision to make Canada a federation resulted from a recognized need to accommodate the religious, linguistic and cultural interests of French-speaking Catholics in a country predominantly populated by English-speaking Protestants. Previous attempts by the United Kingdom to assimilate the French colonists had been unsuccessful and had contributed to political unrest. The constitutional solution crafted to address these problems was to create a law-making system in which the federal parliament would have authority to pass laws in relation to matters affecting the whole dominion while the provincial legislatures would have power to pass laws in relation to matters of more local, or regional, concern. In particular, the provincial authority extended to matters such as education and civil rights, which were seen as being particularly relevant to the preservation of local language, cultural and religious practices. 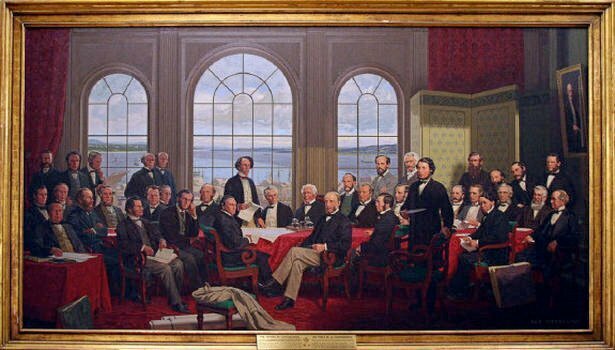 Finally, because the Dominion of Canada was not created on the heels of a revolution, the drafters of the constitution were not particularly concerned about the state oppression of individual rights or freedoms. As a result, unlike the constitution of the United States, the Constitution Act, 1867 did not include any express protections for human rights. Again, this was not changed until the adoption of the Constitution Act, 1982, which includes the Canadian Charter of Rights and Freedoms. By setting out the rules by which a society agrees to be governed, a constitution reflects the values of that society. The Constitution Act, 1867 provides a picture of the values of Canadians at the moment when Canada first became a nation. Because of the history of the colonies which united to form the Dominion of Canada, two of the primary values reflected in the Constitution Act, 1867 are loyalty to the United Kingdom and respect for minority language and religion. These values have shifted over time, giving rise to the constitutional changes made by later documents, including most significantly the Constitution Act, 1982. 4 This is a very brief discussion of Canada’s constitutional history. For a more detailed explanation, see P.H. Russell, Constitutional Odyssey (3rd Edition), University of Toronto Press, 2004. 6 This was achieved by the combined effect of the Statute of Westminster and an amendment to Canada’s Supreme Court Act. For further explanation, see: http://www.jstor.org/stable/1335884.